Ice therapy machines are either motorized or non-motorized cryotherapy devices designed to provide focused cold therapy on specific regions of your body that are in pain (Source). Ice therapy machines are recommended by many physicians and physical trainers to help deal with injuries, recover from surgery, or increase your recovery time from a rigorous gym workout- because of their excellent abilities to reduce swelling and pain (Source). They work by helping to temporarily deaden nerve endings, providing pain relief. They will also retard cellular metabolism to help prevent the secondary damage of tissue. Finally, they are effective in decreasing swelling and the prevention of muscle spasms (Source). In combination, these positive effects will help decrease your recovery time, provide pain-relief, and help you to resume your normal mole life faster. 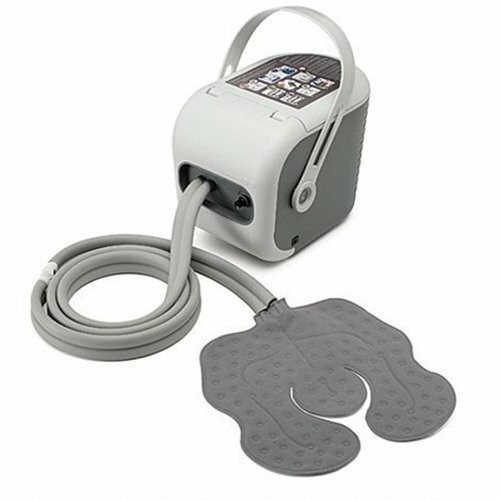 The 4.6 lb., Ossur Cold Rush therapy system is our top pick- it is a motorized option that can include optional knee, shoulder or universal pads. It's designed to be used for up to 6 continuous hours with its 30 decibel motor providing fairly quiet cold therapy for a variety of injuries and surgery rehabs. Users report experiencing pain-relief and decreased surgical recovery times for rotator cuff repairs, knee replacements, torn tendons, arthroscopic surgeries, hip replacements- and a decreased dependence on anti-inflammatory drugs and pain-pills. It is crucial that you keep a layer of insulation between the cryotherapy pad and your skin to avoid injury. Reviewers say that the machine will last through an entire night if kept at its lowest level. One user recovering from a rotator cuff surgery said that he used it for 24 hours at a time for a week after he had his surgery. Other users endorse ice therapy for knees and shoulders. Indeed, the Ossur cryotherapy machine has many raving fans- though on the downside they say that customer support is pretty poor, that it is difficult to get replacement parts because of government prohibitions on selling them, and there are some issues with leaky tubing. That said, the tubing leaks are solved with a towel- not a big deal. If you are interested in a motorized or non-motorized cryotherapy machine- take a look at our comparison table below to get a sense of the best options on the market today. The 4.6 lb (2.1 kg), motorized Ossur Cold Rush Cold Therapy System is an excellent option that is whisper-quiet and compact. Its users love that it is great at continuously delivering cold water for up 6 hours, but also note that condensed water forms outside the tubing, which may necessitate the use of extra towels. The durable motor has 4 power settings. It provides a strong flow rate yet produces very little sound (30 decibels), allowing patients to get the rest they need while getting rehabilitation. It has a high ice-to-water ratio that allows less heat transfer for consistent cold therapy pain relief. It comes with a large shoulder pad and three elasticized straps. This system is a very good option if you are looking for an efficient and quiet ice therapy machine. People who bought of the Ossur system express an overall satisfaction with its effectiveness. They agree that it works pretty well at delivering cold consistently over the pad area. Users are particularly pleased with how quiet the brushless motor is. There were some users though who noted that the plastic tubing may get crimped and/or kinked, slowing down water circulation and potentially damaging the tubing itself over time. 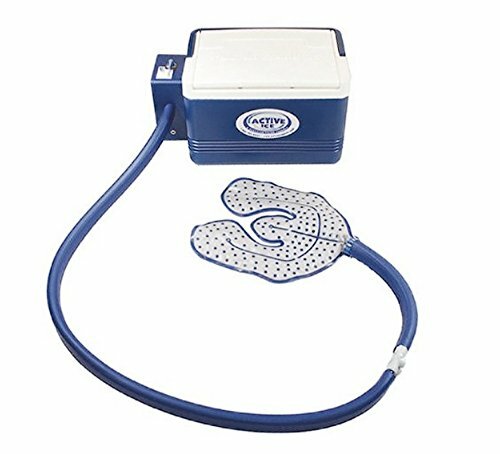 The 16″ x 9.5″ x 8.5″, 5.5 lb Active Ice Therapy System by Polar Products is a good motorized option that has an adjustable flow rate temperature control. Its users like that it is simple to use and has a large 9 qt cooler compartment, but also note that the motor produces a low humming noise. Its 5 ft long insulated cool water line has quick disconnect couplings for easy disconnection when needed. It comes with a 30-minute timer as a safety feature and includes a universal U-shaped bladder (10.5″ x 12″) and one 3″ x 44″ elastic belt. This ice therapy machine is a solid option if you are looking for an easy to use and effective cold therapy system. The general user consensus on the Active Ice Therapy System is that it is simple yet effective. One user said that it is still working fine even after more than 5 years of usage. Users are pleased with the 30 minute timer that comes with the unit to protect the skin although some users find it a bit bothersome to reset the timer frequently. One user said that the quality of the ice chest and the construction of the control box make the unit somehow look and feel cheap. The 14.8” x 8.5” x 11”, 2.4 lb Aircast Cryo/Cuff Gravity Cooler is an affordable option that uses a non-motorized, gravity-fed system. Its users love that it is portable, but also note that you may have to manually press the knee cuff down to get enough cooling to the desired area. The jug holds enough water and ice to provide 6 to 8 hours of cryotherapy. Placing the cooler jug higher than the knee delivers cold water to the knee cryo/cuff, while bringing it lower will circulate the water back to the jug to be cooled again. The cuff can be worn on either the left or the right leg. This product includes tube assembly, plastic fittings and an insulation disk. This gravity cooler is a great option if you are looking for an inexpensive ice therapy system. People who have used the Aircast Gravity Cooler are happy that it provides a much better alternative than ice packs. The small size and portability of the unit allows users to carry it around easily. As one user said, it’s small enough to be taken to the movies. Some users recommend using frozen water bottles instead of just ice to lengthen cooling time. They also like how the cuff looks durable even though the material used feels a bit cheap. The ultra quiet, motorized Polar Iceman3 Cold Therapy Unit is a nice-looking option that has a safety feature that keeps water in the pad at or above 40 degrees F.
Its users love that it is well-built, but also note that it doesn’t have an on/off switch. Its clear cooler design makes it easy to check if an ice refill is needed. It comes with a universal pad and long velcro straps for easy application to various parts of the body. Its unique semi-closed loop circulations system maintains consistent and accurate temperatures. This ice therapy machine is a great option if you are looking for a safe and effective cold therapy unit. Most people who bought this machine are happy with its performance. They enjoy its easily disconnected pad whose connector is provided with plastic caps to avoid dripping. This allows the patient to move away when needed, without having to remove the pad. Users also recommend using frozen water bottles instead of ice for longer cold treatments. They are also happy that it does not produce any exterior condensation. One of the criticisms of this product is the lack of the on/off switch, which means you have to plug or unplug as necessary. 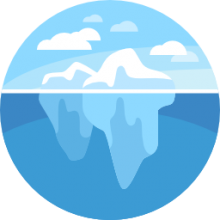 The AC-powered, portable Arctic Ice Cryotherapy system is a cheaper alternative that uses a patented semi-closed loop system and allows precise water temperature control. One user we spoke with explained that the greatest thing about this device is it means he’s able to ice his recent hip replacement for about four hours before requiring replacement ice, and that’s why he bought it. One issue, he told us, is that he wants it to remain colder for a longer time, which would make it a great over-night pain-relief option. Another enhancement could be to have the connector joined together closer to the machine, both electric and ice, so it might be more conveniently drained and re-filled in your kitchen without the need for several trips. Another useful feature would be a remote turn off option so an incapacitated individual can deactivate the device off when it’s no longer supplying cold. One debilitated individual said that as the unit is currently constructed, it will whir and squeak, and she’s unable to power it off herself- her family member has to do it for her. Overall, though, it’s still much better than having to swap ice packs every hour, but there are design improvements that could be made to really enhance the unit’s functionality. Its users like that is quite effective in providing cold therapy, but also note that due to its smaller capacity, refilling with ice needs to be done more often. It utilizes a continuous circulation compression technique, and has 2 switches — on/off and a timer switch with continuous mode. It comes with a universal cooling pad that connects to 6’ fully insulated hoses. It can provide 6-8 hours of cool water on one single fill-up. This cold water therapy machine is a great option if you are looking for a smaller and more budget-friendly cryotherapy device. Users of the Arctic Ice therapy system are generally satisfied with the effectiveness of this product. Its good build coupled with its lower price range makes it an attractive choice for many. The built-in timer is also one of the good attributes that users like about it. Even though the motor produces an audible hum, users find that it is not loud enough to be considered a disturbance. One user noted that their unit had a leak at the point where the tube of the cooling pad connects with the main tube, but most other users said that they didn’t find any leaks at all. Cold therapy machines are designed to deliver cold, pain relief over a padded area. These cold therapy systems frequently use motors to deliver a strong and controllable flow of ice therapy to regions of your body that are inflamed and injured. As we have previously observed, it is crucial that you do not apply the padding directly to the skin- you need to maintain some insulation between the skin and the pad. Some users have cut out a piece of towel that is similarly sized to the shoulder or knee padding included with the ice therapy machine and used that to prevent any skin damage. One user who had a complete knee replacement writes that she was in severe pain from swelling and she began using the Ossur cold therapy system with a rollator, and immediately experienced a pain drop off of around 50%. Another user who had recently undergone rotator cuff surgery is similarly pleased with the Ossur therapy system, saying that several weeks subsequent to the surgery, having used ice therapy and pain relief patches for that time, he has experienced a significant decrease in pain, increased ability to sleep, and reduction in his pain-pill dependence. Why is a cold therapy machine better? While you can try to use an ice pack on an injury, you are certainly aware of how messy and inefficient this process becomes if you need to use it for an extended period of time. Ice packs become a drippy and soggy mess that cannot, often, provide adequate cold therapy compression to the full, afflicted area. As well, cold therapy machines provide deeper-penetrating as well as longer-lasting cold therapy than traditional ice packs. Ice therapy machines also provide active compression- the combination of therapeutic cold and active compression is another reason why they outrank traditional ice packs in providing pain-relief and swelling reduction. This compression is useful for promoting lymphatic injury drainage, edema removal, as well as increasing blood flow circulation to injured tissue areas- all of which help to promote natural body healing. As we have seen from user testimonials, the universal wraps that cold therapy machines include can provide better coverage than a traditional ice pack that will sit awkwardly on a knee or a shoulder. Because of this, the cryotherapy benefits will penetrate more broadly and more deeply into the injured areas- providing a pain-relieving cryotherapy wrap that many users recovering from surgery cannot live without. Another added benefit of cold therapy machines is that you can experience their healing effects while you were sleeping. You can configure your ice therapy machine to provide cold therapy during the night, which can actually help you sleep, and receive the therapeutic benefits that will help you get back to athletic training or just a normal life more quickly. If you sleep better- you will heal faster! One final reason why cold therapy machines are better than traditional ice packs for ice baths is that they let you control the temperature, with many of the models providing temperature safety regulation features. As you can imagine, you wouldn't want your cold therapy to become damaging- you need the cold sensations to remain at a safe level throughout the cryotherapy devices application. When you are in pain, you want to use heat or maybe ice. However you are not necessarily sure. There are two totally separate entities. They should not be used together except if you understand what you're doing. Which one is better? When should you use one and not use the other. Briefly, ice can be used for acute injuries. Acute problems are something that only recently occurred like an injury or fall. Generally this will probably be inflammation. There is likely to be swelling a redness- you need to reduce the swelling, lessen the inflammation to avoid the problem getting worse and also blocking a healing phase from taking place because of an excessive amount of inflammation in the region. Heat, however, is for chronic conditions- issues that are not acute strains, pulls of muscles. So when you look at the advantages of cold therapy and ice, it lessens the amount of recovery time, decreases the pain that you'd feel after the injury and when it's applied in the right area, right after an injury, the risk of cell death is limited, so ice can do you a lot of good in preventing the problem from getting worse. Now, the advantages of heat- it increases blood flow to the area. It cuts down on the exudates, which are the toxins residing within the cells. It will help relax muscle. It produces lots of circulation to help bring in lots of oxygen, therefore it can heal much faster. That's it- the difference between ice and heat. Make the right choice and you will notice a considerably faster recovery. Maintaining a safe and constant temperature is an ideal way of providing therapeutic relief for a variety of athletic and acute injuries, and treating specific areas of the body including the ankle, groin, shoulder, knees and wrists as well as your back. If you're in the market for one of these devices, check out our comparison table at the top of the page, always make sure to consult with a physician or your primary healthcare provider to make sure that these devices are right for you, and click through to individual product pages to get a sense of what other customers are saying about the units they purchased.